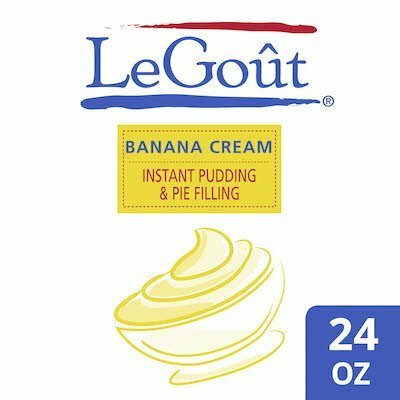 Instant pudding and pie filling mix with Banana flavor. Perfect for banana cream pie. SUGAR, MODIFIED CORN STARCH, DEXTROSE, PALM OIL, DEHYDRATED BANANA, SODIUM PHOSPHATE, TETRASODIUM PYROPHOSPHATE, HIGH OLEIC SUNFLOWER OIL, SALT, CORN SYRUP SOLIDS, CALCIUM SULFATE, SODIUM CASEINATE (MILK), DIPOTASSIUM PHOSPHATE, ARTIFICIAL FLAVOR, YELLOW 5, YELLOW 6, NATURAL FLAVOR. Ideal for creating pudding and pie fillings.